Not that Cultists needed help, but this guy seems pretty bad for the tribe. Unique, low skill, few icons, a really risky Forced Response. I assume its supposed to help against control decks? Danigral - 2 out of 5. I don’t think this card is too bad given perfect circumstances. It can force your noob opponent to commit to situations that he otherwise wouldn’t, but the problem is that you are giving the choice to your opponent on their story phase. If he has a support to spare, or just doesn’t care if he loses a support, he can force you to lose a support too. It’s just too situational and there are much better cards to put in your deck. mnBroncos - 2 out of 5. Force response usually isn’t great. Also, if your opponent didn’t send anyone then neither can you so will hit both of you. If you're not running many support cards can try it but still don’t think he will see much play (guess maybe in cultist decks). Obtuse - 2 out of 5. Your cultist deck was already running Deep One Assault, right? If you didn’t already have a decent option for support removal in faction I could see him getting a longer look. I actually like the idea behind the design though. Often characters go to stories unopposed because there’s not a lot of benefit in risking characters in defense in a lot of situations. Some cards that punish you further for sitting on your heels is something I’d like to see more of. WWDrakey & Ire - 1 out of 5. We can see what the thought process was here. 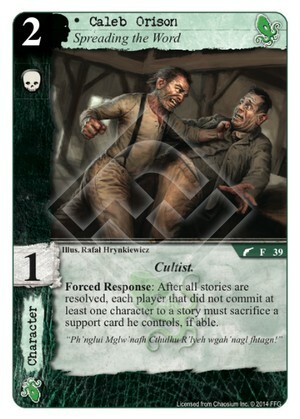 “Hey, those Cultist Temple-decks, they need some Cultist-based support control too, but nothing too good.” “Well, let’s give ‘em something that really only works if they first empty the board with the nom-nom-nom sac-action from Temple of R’lyeh.” The problem here is, that those decks usually only have a single support card on the table. Yep, that would be the Temple. And that’s the one card they can’t afford to lose, everything else can be replaced. Building a fail-condition into your own deck… just isn’t a practice we can advocate. Correct me if I'm wrong, but I believe his effect doesn't happen if no one goes to stories. I don't think the reviews above quite hit the mark IMO. I think Caleb is meant to see the table for a couple turns, at most. After he's sacked the opponen's support cards, he's meant to be sacrificed, in true Cultist fashion, to something far more dangerous than him. That's how I see it anyway. I think this is right. From the FAQ, "Stories will resolve only if the active player has characters at that story." So if the active player does not commit characters to any stories, the Forced Response is not triggered.